Personalised Christmas tea towel featuring a cute reindeer in a Christmas sleigh motif and embroidered with a personalised message or name. Personalised Christmas tea towel featuring a cute reindeer in a Christmas sleigh motif and embroidered with a personalised message or name. This embroidered gift features a Christmas reindeer with a red nose riding in a sleigh and your choice of text personalised underneath. 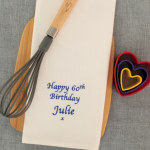 We use natural white cotton tea towels hemmed on all the sides.52 x 72cm. 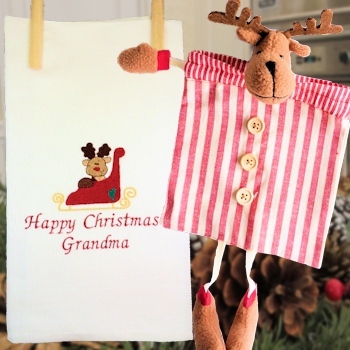 Personalised Christmas tea towel featuring a cute reindeer in a Christmas sleigh motif and embroidered with a personalised message or name. This embroidered gift features a Christmas reindeer with a red nose riding in a sleigh and your choice of text personalised underneath. We use natural white cotton tea towels hemmed on all the sides.52 x 72cm. You can have any name or nickname you want! Choose a letter font style for the text. (Reindeer bag not included, decorative for picture only).